The species is widespread in southern Britain, becoming scattered in the north. It is widespread in western and central Europe as far north as southern Norway. 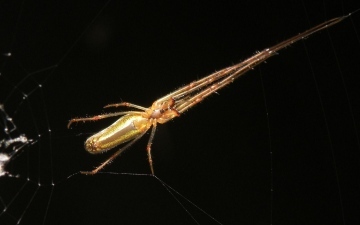 Orb webs of this species are found on trees, bushes and low vegetation in a variety of habitats, mostly at low altitudes. It may be found close to water but is less closely associated with wetland habitats than T. extensa. Both sexes are mature from early to mid-summer and sometimes into the autumn.